PARIS (AP) — French conservative candidate Francois Fillon is refusing to quit the presidential race despite receiving a summons Wednesday to face charges of faking parliamentary jobs for his family. 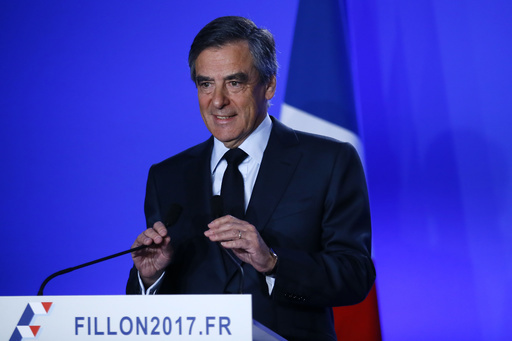 Calling the investigation a “political assassination,” Fillon called on his supporters to “resist” and said he would leave it up to voters to decide his fate. Once a front-runner in the race for the April-May two-round election, Fillon’s chances have slipped since the probe was opened in January. Fillon abruptly canceled a campaign stop Wednesday after receiving the legal summons, prompting media speculation that he would quit the race. The court summons was widely expected after the financial prosecutor’s office pushed the case to a higher level Friday, opening a formal judicial inquiry that allows investigating judges to file preliminary charges. Financial Prosecutor Eliane Houlette denied reports that Fillon’s wife Penelope was taken in for questioning Wednesday. Fillon, who won the conservative primary on a platform of tighter security and public spending cuts, initially said he would withdraw from the race if he was charged — but later said he was determined to let the voters judge him instead of investigators. “France is greater than my errors,” he said Wednesday. The alleged fake jobs are especially shocking to many voters because of Fillon’s pledged spending cuts and his clean-cut image. Investigative weekly Le Canard Enchaine reported that payments were made to Penelope Fillon and two of their five children that totaled more than 1 million euros ($1.1 million) over many years. After a preliminary investigation opened Jan. 25, the financial prosecutor’s office decided Friday to launch a formal judicial inquiry, turning it over to investigating judges who can bring charges or throw the case out. The list of potential charges include misappropriation of public funds, abuse of public funds and influence trafficking. Protesters have been at Fillon’s recent campaign events for the election, in which far-right candidate Marine Le Pen is expected to make a strong showing. Fillon’s Republicans party has no clear Plan B for an eventual withdrawal by Fillon. The runnerup in the party’s first-ever primary, the more center-leaning Alain Juppe, has said he would not want to run in Fillon’s place.